Born in New London, Pennsylvania, he studied law with his cousin David Finney, and then under the eminent Francis Allison. As a student he served as the clerk of the prothonotory Court of Common Pleas for the county of New Castle, Delaware. He was admitted to the bar in Delaware before the age of 21. In 1756 he was commissioned to his first political office, that of deputy Attorney General to county Sussex, in Pennsylvania. The following year he was admitted to the Bar of the Supreme Court of Pennsylvania, and at the same time appointed clerk of the Assembly of Delaware. 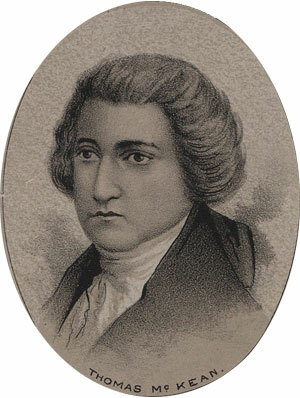 In 1762 the Assembly appointed him a colleague, along with Caesar Rodney, charged with revising and printing the laws of the province of Delaware. Later that year he was elected a delegate to the Assembly, and was re-elected for seventeen years despite a six year residence outside the commonwealth, in Philadelphia. At the behest of the Assembly he served as a trustee of the provincial loan office from 1764 to 1772. In 1775 he was the delegate for Delaware at the Stamp Act Congress in New York. In 1771 he was appointed collector of customs and commissioner of revenue at New Castle. In 1772 to was chosen Speaker of the Assembly of Delaware. Beginning in 1774 he attended the Continental Congress where he served on the national council throughout the Revolutionary War. He also served on the committee to draw up the Articles of Confederation, was commissioned a colonel in the New Jersey militia, and served as President of the newly independent Delaware. In 1777, still serving in the Congress under the articles of Confederation, he was appointed Chief Justice of Pennsylvania, an office that he held for nearly twenty years. He was elected President of Congress in 1781. In 1787 he attended the ratifying convention for the new Federal Constitution in Pennsylvania. In 1789 he played a role in amending the constitution of Pennsylvania. He was elected Governor of Pennsylvania on the Federalist ticket in 1799. Political enemies tried to impeach him, but were unable to prove any wrong-doing. He filled that office by popular re-election for nine years, retiring in 1812. He died on June 24, 1817 at the age of 83. *Pennsylvania, Delaware, and New Jersey. Pennsylvania and Delaware were not fully distinct colonies until 1776. From 1701 to 1776, both existed under a common executive, but had separate legislatures.